This is the second soup I’ve made based on a stock in Mark Bittman’s Simple Stocks for Soup on the Fly feature. I promise it is, indeed, both simple and super fast. I think I might be addicted to this organic lapsang souchong. It’s a rich wood-smoked black tea. The ginger and peppercorns in this recipe lend a subtle bite to the soup while still allowing you to taste the sweeter notes of the tea. I honestly had my doubts about whether all of these flavours would work together—the smokey/spicy/slightly sweet broth along with meaty portobello mushrooms and nutty soba noodles. It turns out that the depth of each of these flavours allows them to blend wonderfully. In a medium-sized pot, bring the water to a boil along with ginger, peppercorns and red pepper flakes. 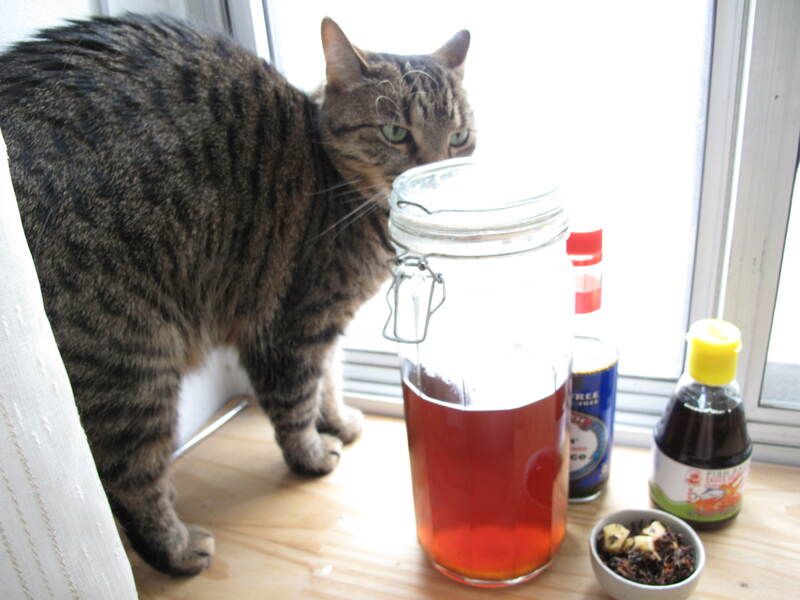 Did I mention to set your broth aside in a cat-proof area? Turn off the heat and allow broth to rest for a couple of minutes before stirring in the tea. Allow to steep for 5-10 minutes, depending on desired strength. Stir in fish sauce and soy sauce. Strain the mixture into a separate container and set aside. Fill another pot with water and bring to a boil for the soba noodles. Heat oil in a pan over medium-high heat (you need a relatively high heat to get a good sear on the mushrooms). Add sliced mushrooms and stir gently until slightly browned. Toss swiss chard into the pan along with two tablespoons of water. Cover pan with lid for a moment until the greens have wilted. Stir chard until coated in oil and turn off the heat. 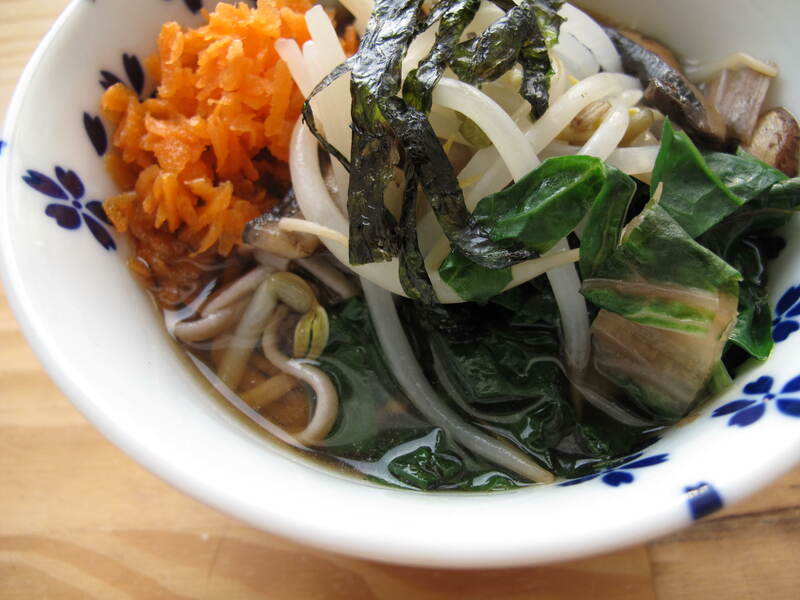 When the water has boiled, reduce heat slightly and add your soba noodles. Allow to cook for 5-8 minutes until noodles are tender. Immediately transfer noodles to a colander and run under cold water, tossing the noodles with your hands. Soba noodles really like to stick together, so getting some of the extra starch off will help. Assemble your bowl by adding the noodles, then the sautéed veggies and the broth over top. Garnish with nori, carrots and sprouts.